My fire wood is the same, when I hope I can start to stock a bit the weather changes and down goes what I hoped to be selling this time, but next year. I take it you are off to a show, if you are taking besoms? I keep telling myself to give up work, but the money keeps coming in and it makes me get out of bed in the morning. The problem is that when I get to the weekend I'm half dead and don't do as much as I could if I was at home all week, and just plodded on gently. I have to cut and chop 3-4 nets today and every day for the next few months. I guess I could find another source of income somewhere if it became necessary, or learn to draw the horns in, shop once a week instead of every day, and start on a vegetable plot again-I can get the timber to make raised beds, and I have plenty of wood to cut down for fuel, my original plot being taken over by a network of tree suckers which will involve a digger for a few days, more expense! I can always let the land for grazing and get a cash return, which I haven't done as the couple who use it are good to me in other ways-she does the washing which is a serious bonus so I give the grazing for that, and she gets good discounts for things I want from where she works. The boyfriend helped me when the end blew out of a building and shored it up and is now the new improved drying shed! Could you reduce the number of days you work Gregotyn? That way you would still get some income from the job and have more time to make your kindling nets. I would think in fact that the day job is more lucrative than the nets, but if you enjoy doing the nets, the art is to balance the two without tiring yourself out too much. Sounds as if the neighbours do a fair amount for you in return for the grazing, so might be better to keep the arrangement if you can afford to do so. I managed to get some more small besom heads made up, but am now off sick with a throat infection. As I am having trouble swallowing, the doctor has given me a liquid antibiotic which tastes foul. Hoping it will work in a day of two and I will be back to normal for the show. To be honest the day job, savings and my pension mean I don't have to work, but when I started to supply the shop, I was not so well off about 15 years ago. And now I can't stop, sort of insurance and desire not to let people down. I have chopped firewood all my life, one way or another, since I was 8yo, when my father died, and it was my contribution to the household, along with collecting the manure from the milkman and baker's horses-yes I'm that old!- to grow pansies for sale at the front garden gate-3d each plant. And I gave up pocket money, 6d, for that. I think my mum's widow's allowance for me was about £3.00 a week in the mid 50's. My neighbours help, but I don't want to live in their pocket, they are there if I need them, I don't charge them for the grazing because they do help and would be needed in an emergency! I have just had a hike in rates up by 25%, which I find extortion. They said 9.5% was the extra needed this year, but not for me it appears! Sorry to read of your infection M.R. I hope you get better quickly and you can go to the show. Foul liquid works fastest! It is at this time of the year that the gardeners start on me for work on the wooden bits in allotments and so on, makes a change from kindling and more lucrative per unit of time, but the chopping still has to be done! That is the problem when you start something like that Gregotyn; you feel people rely on you. Have fun making the bits for the gardeners. I need some new bits for my raised beds and one new one, but so far husband hasn't 'got round to it'. I am a bit better, although it seems to be a bit slow. I managed to eat something solid yesterday, although it took a long time as I had to chew it very thoroughly. Trouble is with rates that various councils all add their bits. I would check your bill to make sure they haven't made a mistake though. First show of the season yesterday, and it was sunny, but nasty cold wind. In the end we put up one of the tent sides; cut out the sun, but also the wind, so slightly warmer. Did well with besoms, but about only thing we sold, so not brilliant. A friend who also had a stall said people just weren't spending. Absurdly warm weather. It reached 78 degrees Fahrenheit on Monday afternoon. Plants are hurling themselves into bloom. Which means, alas, they will also pass rather promptly. But I am getting some rather nice images with the new camera. 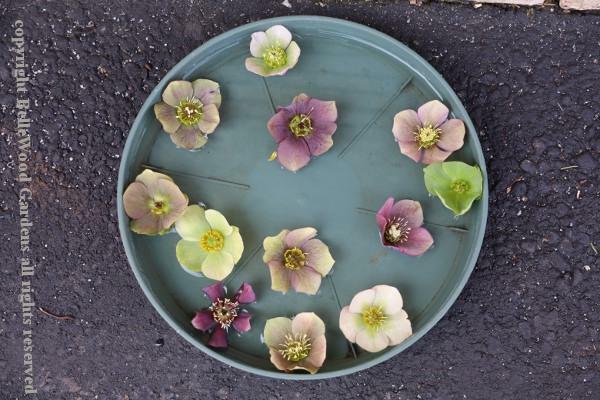 Cut some Lenten roses and floated them in a saucer of water. Bees are enjoying the Christmas roses too. Rather more like Easter . 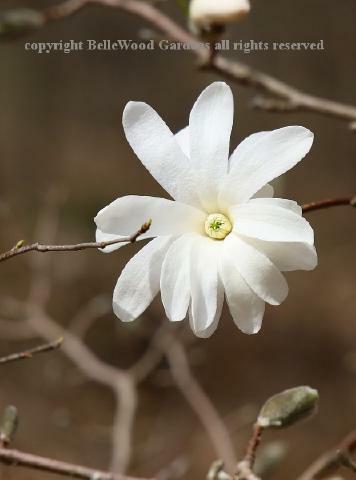 . .
And the star magnolias are looking quite splendid, don't you agree? Those are all lovely Jam Lady. The Lenten Roses arrangement looks particularly dainty. Our star magnolias have been out for some time; not sure if they are finished yet, because there aren't any immediately round home, but the later ones are coming out. Our bluebells are starting to come out, so the signs have to go up asking people to behave nicely. In particular not walking in them or picking them. The latter has been illegal for years, but people still do it. If I get a chance today I want to see how the early purple orchids are getting on, but think I have an appointment with some more log sacks, and perhaps some charcoal. Glad to hear you are a bit better-look after yourself MR. Sorry the show was not so good, MR, I guess it was the first show and if your weather is like ours it may be sunny, but it is not warm. Today is a fine example very sunny, but I have been in my working clothes with the extra jacket on all morning. I quite enjoy the gardening wood working bits for folks, making a change from my normal sawing wood to 6 inches and chopping thin strips! It is worth doing and makes a change, but being an "'umble woodcutter", pays some of the bills. I will be keeping the neighbours' current arrangement, it suits me well, with their horses, I just wish they would collect the manure into one heap and I could spread it evenly all over, in the autumn. I have asked, but it seems beyond their understanding and/or ability!! And of course it would be an excuse for buying a manure spreader. I am impressed with the flowers Jam Lady. 78 degrees is a bit on the warm side of comfort for me, I am a cooler weather man myself, but at this time of the year that would be decidedly hot for this area. I don't know if I said, but local chap brought some wood for chopping from a man who constructs knock down condition-KDC- farm machines and they all arrive in this country in large crates in bits and he puts them together normally burning the crates wholesale. So neighbour volunteered to bring some over. They all seem to come apart with my crow bar quite easily, and the chopping is easy generally so I am hoping for more soon, we'll see. That seems like a good source of wood for your kindling Gregotyn. Odd how some people find simple things like gathering manure together into a heap impossible. We had a wet day yesterday, so husband decided it would be a good idea to get the shopping out of the way yesterday, so took me there in the afternoon. I may now get the log sacks done today, but still need to take it a bit easy as I get tired rather easily and have a talk to give this evening. That's why I especially like llama and alpaca for manure. Most useful - they have a dominance thing and they all poop in a single pile so it is all nicely gathered together for you. Secondly, their manure is nice little pellets - think deer or rabbit. Lastly, the analysis is 5-3-3 so doesn't burn even if used fresh. Good stuff! Alpaca wool is nice for spinning too, and they are quite reasonable animals. Llamas less so. I did go to a show once where an alpaca was grumpy about being there, and it grumbled all day. Never caused any trouble though. Having the manure in pellets is useful, as you say, Jam Lady. Perhaps I ought to go and have a chat to our local alpaca people. i would consider alpaca wrangling, they are charming and quite jolly, llamas are grumpy and rather aggressive at times and well down my list of " it's ok it is not dinner "
stringy as donkey and a rather strong flavour but that could have been cook's fault. Llama yarn is good for rugs, alpaca is quite nice, vicuna is the best. Vicuna run wild. Periodically they are rounded up, sheared, and turned lose again. Llama are pack animals, not raised for meat. That's cuy, aka Guinea pig. My brother once went on a trading journey in Peru. Llama will lay down and refuse to move if they think they are overloaded. And when they think they have gone far enough that day they will also all lay down. I've seen back packers in the Colorado Rockies accompanied by llama pack animals. Their feet are better for the habitat than horses. Just had a problem logging in I forgot my password code, but all of a sudden it took the obviously last choice, but I can't remember that choice! Tomorrow could be equally challenging! I know all the letters and numbers just the order and which are capitals! Life is going a bit that way too. I get to work on time-well early-and stay as long as I like, lucky me, but I still lose my thoughts sometimes and am elsewhere! Guess there will be a 'home' for me when I get past it! I don't understand the kindling sales this year I am doing more and more and am hardly keeping up, when by now in this warm weather it should be at almost nil, and I am getting stocks ready for next season. I am now getting into a wood store which has not been attacked for 12 months and I hope to clear it to get to the rip saw sited beneath the said pile, and use it! Blue bells, MR, just don't happen till late May in a good year, I have seen no foliage yet. We still have primroses in bloom. I hope the talk went well, and you are feeling better. Odd you haven't seen bluebell foliage yet, as with us it starts to come up some time between mid-December and mid-January. It is no indicator of when they will flower though, as the foliage started coming up in mid-Janauary, and the flowers are starting now. Sadly they are going to be in full flow for the Easter holidays, so chaos will reign. 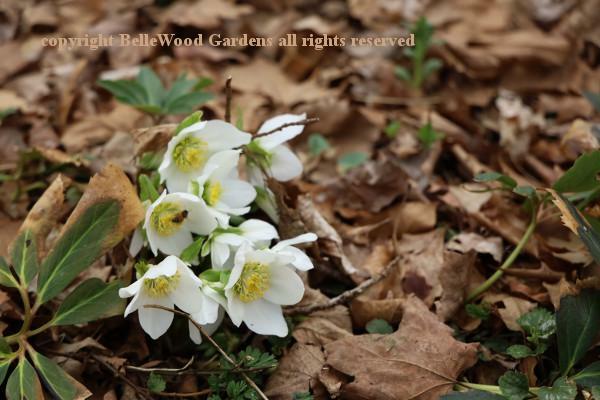 Sometimes we have a distinct wood anemone and bluebell season, but this year everything seems to be mixed up together. Our log sacks are gently meandering, but nothing like last year when it was still cold. Perhaps people are just having a fire in the evening, so don't need many logs but do need kindling to keep re-lighting the fire rather than keeping it going. We have an order from one of our outlets for log sacks and charcoal, so rather a mixed time of year. Husband and son got the bagger going yesterday and managed to bag 26, so the remaining 20 odd will have to wait for another day. We have 2 more outlets saying they will take some, so the season will soon be in full swing. The throat infection is better now thanks, but I still have a slight sinus infection, so the doctor has changed the medication to a different antibiotic, thankfully now in tablet form. I think the odd colour of the previous one is a good description of the flavour-it was vile. The talk went well, and they may want another one on a different subject in the future.